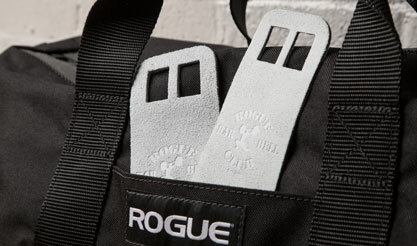 Rogue’s Gymnastics Grips are the proven accessory for protecting your hands during high-rep pull-ups, kettlebell swings, toes-to-bar, and dozens of other palm punishing movements. With this second generation design, we’ve included textured American leather on both sides to eliminate slippage, and a convenient hook-and-loop strap for a custom, comfortable fit. The new grips are gray in color and embossed with the Rogue Barbell Club logo. Choose from one of three sizes using the simple sizing chart below. Thin, lightweight, durable, and versatile—a pair of Gymnastics Grips fits in the smallest compartment of a gym bag or a back pants pocket. 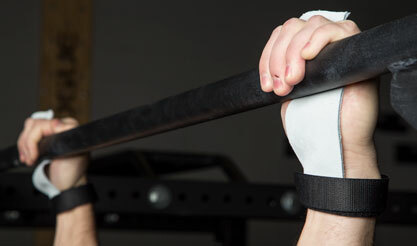 And with three sizes, it’s easy to equip a gym with effective grab-and-go grips for every athlete. While a lot of hand protection wraps, gloves, etc. require a lot of time-consuming application, removal, and re-fitting as you move from one workout to the next, Rogue Gymnastics Grips allow athletes to simply turn the grip portions around to the back of their hands when they don’t need them. Going back to the pull-up bar? Simply twist the grips back around and put your fingers back through the finger holes for a secure fit once more. Our V2 Grips measure 2.5” in width and are made from textured American leather on both sides. This produces a more consistent, firm grip across a wide variety of movements, and helps prevent bunching and slippage during high-rep work. The design also features two precision-cut finger holes and a hook-and-loop strap for a custom, secure fit. Along with being the leading manufacturer of American-made strength and conditioning equipment, Rogue also offers a wide array of exclusive gear and accessories to keep you training longer. 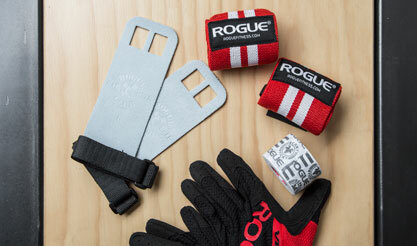 From wrist wraps and lifting straps to weightlifting gloves, sticky tape and handcare products, we have you covered. For as long as pull-ups have existed, athletes have suffered from ripped up hands as a result of high rep workouts. These most minor of injuries can still keep you out of the gym for a week while you wait for them to heal. 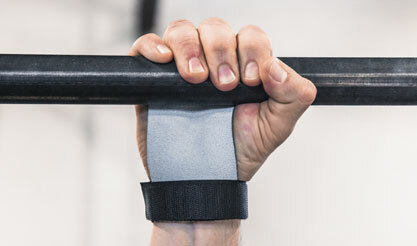 This is why the simple addition of Gymnastic Grips can not only offer basic hand protection, but more productive time in the gym—and better results—over the course of time. 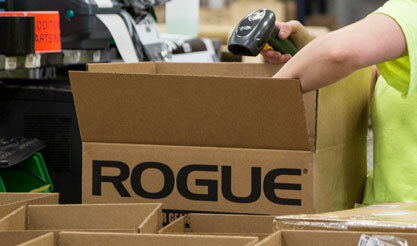 Rogue V2 Gymnastics Grips is rated 4.3 out of 5 by 74. Rated 5 out of 5 by mmccormick from Great hand savers! (tip for breaking in) I liked these much more after they were broken in. Here's a little tip on how I did it which comes from how I use to break in baseball gloves. Tip for breaking in leather gymnastic grips. 1. Fill a tall microwave safe kitchen glass 3/4 full of water and microwave for 2.5 minutes ish. You want the water very hot. (use a hot pad to pull the glass out carefully when done). 2. Roll the grips up like a piece of carpet and push them down into the water (use a wooden spoon). 3. Let the grips soak for 15-30 minutes ish.. 4. Take them out and let them air dry hanging on the side of the sink (should take a day or so). 5. The grips will feel a little stiff initially, rough them up a bit with your hands and they will turn super flexible and completely broken in. This should work for "reviving" old grips as well. Rated 4 out of 5 by sptarbell from Great hand protection. Terrible velcro straps. I just received these in the mail Friday and used them on a Saturday workout with pull ups. The leather is good quality. It isn't too thick where you feel like you can't grip the bar, nor is it too thin where you feel like it isn't helping. They do bunch up a little bit when you jump up and grab the bar, but it is something you just get used to. My only complaint is the wrist strap. It is very basic velcro with a plastic piece the velcro loops through. 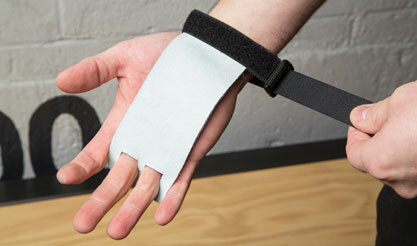 The velcro is a bit abrasive, and the plastic piece rubs your wrist. I played around with them and tried pull ups with them loosened a bit, as well as tighter, and regardless of how tight they were, they still rubbed my wrist raw. I recommend them because of how well they protect your hands, but i'm disappointed on the quality of the wrist straps. Rated 4 out of 5 by Kcummo from Almost. The strap that goes on the right hand is perfect. But the strap that goes on the left hand...well that plastic piece DIGS in the wrist and will leave you permanently scarred. If you made it so that the plastic piece for the left hand strap was on the opposite side...like the right strap is...these would be perfect. Don't know why you haven't done this with all the other complaints about them. Rated 3 out of 5 by immunonerdchic from Still exposes calluses in the S size The same problem as another reviewer - I measured my hand and bought a small, seems like the correct size across the palm except the finger holes are way too large, so the grip slips down, leaving my hand exposed in the exact area that I am trying to protect. Seems like its not just the length of the leather that should change with the sizes, but also the finger opening. Or maybe I am missing something and there is a technique to placing hands on the bar to keep the leather grip in the right spot regardless? Rated 3 out of 5 by Phlongo from Good but could be better Rogue- time for a V3 re design. These grips are nice and are made out of the proper material for their purpose but the buckles and wrist straps are simply badly designed. The grips or identical... Meaning they are really only made for one hand. Unfortunately I do not have two left hands so the plastic buckle always digs into my right wrist. Once rogue gets the design right these will be very nice grips and I would easily give 5 stars. Rated 5 out of 5 by nona from Awesome Hand Protection I have used every grip/ glove out there, these are the best by far. Rated 4 out of 5 by WarEagle82 from Great, but need a slight re-design Love these, except for the buckle on one hand being under my thumb. This is due to the grips being identical. If the buckles are opposite on each grip, then they are on the lateral part of the wrist and don't dig into the thumbs tendons/nerves. With that feature, my 4 stars goes to 5. Rogue, please fix this and I'll buy these until I die! Rated 3 out of 5 by Evan Beach from Good, but the plastic piece is painful These work well, but both are meant for the right hand, which means the plastic piece digs into your left wrist below the thumb, especially if you're wearing them with HSPU or HS walk in your workout. If you wear with it with a wrist band it helps. Strap could be made with a material that is a little less abrasive, too.